Ni-Cad battery, 12 V, 2000 mAh. The battery is brought to you by Battery Barn. 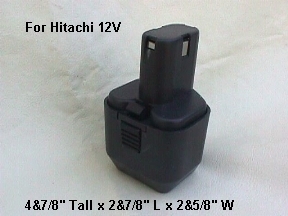 It works for Hitachi EB12 , EB12G , EB12S , EB12M ,EB12H , EB1224 , EB1230H, 300004 , 310453.